Citra Pearl Fair Face Cream with Korean Pink Pearl - Good Buy ? 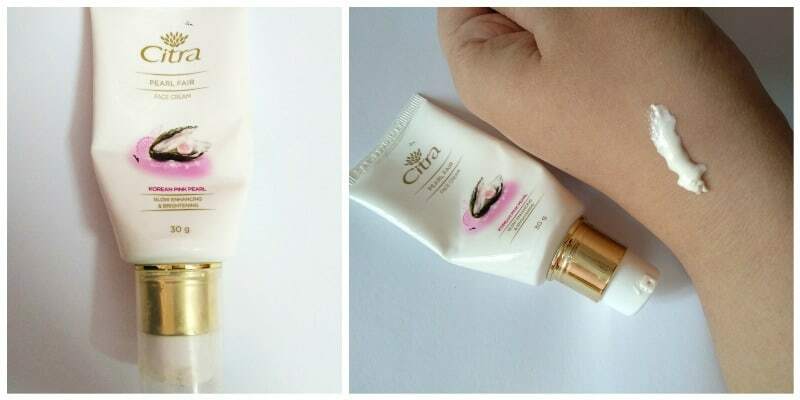 Home ReviewsBeauty Citra Pearl Fair Face Cream with Korean Pink Pearl – Good Buy ? Who is it for? Citra Pearl Fair Face Cream with Korean Pink Pearl is supposed to nourish and smoothen the skin from within, provide an instant luminous effect and reduce dark marks. After cleansing your face, apply the cream is gentle motion, massaging it in. It has a tube packaging with a pump dispenser which makes it travel-friendly and mess-free. It has a peal like color, like most day creams. It has a slightly thick texture. It has a pleasant and refreshing fragrance. I needed a light day cream which I can wear to college. You need to massage for a bit too perfectly blend it. It gives a nice and subtle glow and is not at all heavy. I have dry skin, but with this cream, I do not need to apply moisturizer alongside. It definitely does not remove any marks, I just like to use it as a day cream. It does not irritate my skin or cause any breakouts. Its pump dispenser is definitely a plus point. A patch test is always recommended. The pump dispenser is really nice. Does not irritate the skin or cause any breakouts. Does not reduce any marks as claimed. People with oily skin might find it a bit heavy. Yes, I would recommend as it is a nice day cream.